In Puerto Pollensa during the season it is necessary to pay if you occupy a parking space with blue lines (check the hours/days for when this is necessary on the meters). There is pay and display parking in front of the marina Otherwise there is parking on unmade areas, and if you’re struggling to find a space try near the La Gola nature reserve. There are limited public toilet facilities in Puerto Pollensa. There are facilities behind restaurant stay on the harbour, and on the main beach there are a couple of toilet blocks, but expect to pay a mínimum amount. The best option would be to pop in a bar for drink or buy a bottle of water and ask if you can use the facilities. Showers are situated along the beach in Puerto Pollensa. Hours/time : The working day for many shops starts at 10:00am, finishes for lunch at anything from 13:00 to 14:00 and then starts again from 16:30 or 17:00 till around 20:00 or 21:00: Many essentially tourist shops stay open all day, including supermarkets. The main supermarkets (such as Eroski) have long hours, normally to 21:00 and are open Sundays till 14:00 in summer. Watch out for local holidays as these can mean that places are shut. The Spanish sense of time differs to British in the sense that “mornings” extend to 14:00, “afternoons” finish at 20:00, and evenings … well, who knows. The concept of midday (mediodía) is a very loose one. It normally never means 12:00, but any time till 14:00. There is a tourist office by the entrance to the nautical club in Puerto Pollensa, one near to the bus station in Pollensa, and one close to the Calas Clara and Barques in Cala San Vicente. Hours of opening vary. 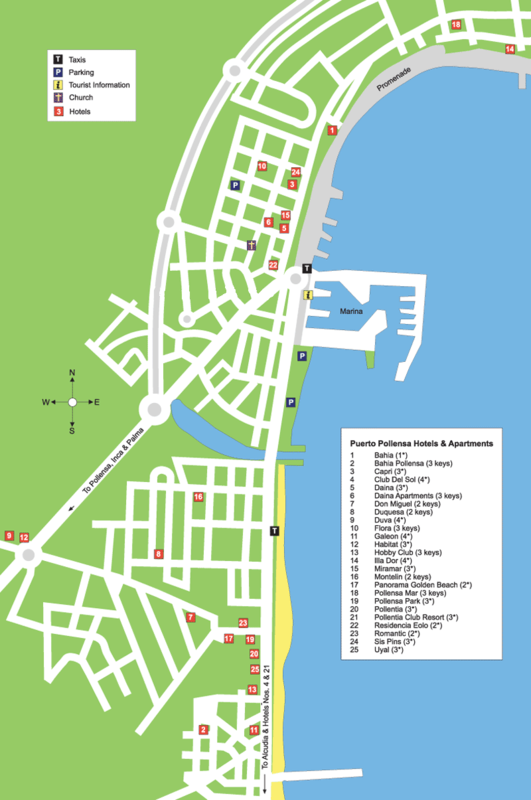 There are several Exchange shops along the main Street in Puerto Pollensa & all hotels and Banks offer facilities. It is now becoming quite popular for people to use pre paid cash cards (travel cards) that can be organised with your tour operator prior to your holiday.